The Mars Curiosity rover unleashed its laser beam eye today, zapping a nearby rock dubbed "Coronation". [UPDATE: Here’s the "After" picture! This isn’t mad science! It’s cool science. Here’s the deal: when atoms and molecules absorb energy, they can re-emit that energy as light. The nifty part is, each type of substance emits a different color of light, making it possible to identify them. This is called spectroscopy, and we use it in astronomy all the time. Many objects like gas clouds and stars emit light naturally. We just have to observe them and pick out the signatures of the different chemicals in them. For a Martian rock, though, we need to dump some energy into it to excite those substances. And that’s why Curiosity has a laser on board. It can zap a rock with a short, intense pulse of laser light, and the rock will respond by glowing. A spectrometer – a camera that can separate light into individual colors – then observes the glow, and scientists back home can see what the rock’s made of. 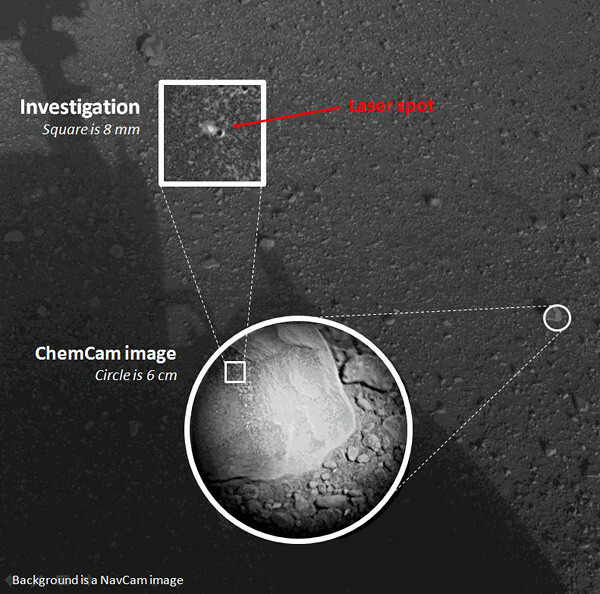 It’s like DNA-typing or fingerprinting the rock, but from 150 million kilometers away. Reports are the laser worked perfectly, blasting away at the rock with 30 one-megaWatt pulses (lasting 5 nanoseconds each!) in a span of about 10 seconds. Scientists are poring over the results now, and hopefully we’ll hear more about this soon. I just wish they had named the rock Alderaan.